What are some of the fallacies with the Amillennial and the Post-Millennial views? Dr. Reagan: The predominant end time viewpoint in Christendom today that is so popular among the masses of people is not the Pre-Millennial, Pre-Tribulational view, but the viewpoint that is held by most denomination including the Catholic Church and that's what's called the Amillennial viewpoint. It says that we are in the Millennium right now and there will be no future reign of Jesus Christ. Jesus will simply come and take us to Heaven and that's it. What do you see is the weakness of that viewpoint? Gary Fisher: One thing my wife instructed me to say is, "It just plain and simple doesn't make sense!" Dennis Pollock: We're glad you got that in! You've got to keep her happy. Gary Fisher: It just plain doesn't make sense. When you read the Bible it declares that there is going to be a kingdom on earth. This was Old Testament theology. This is what the Jewish nation always expected — for there to be a king ruling and reigning on earth. Jesus introduced a new theology to them in John 14, "I go to the Father's house to prepare a place for you." But, before that the Jewish theology was that the king was going to come to earth. That is called the Pre-Millennial viewpoint. Dr. Reagan: Has anything in the New Testament negated that? Gary Fisher: No, absolutely not. Dr. Reagan: In fact, it reinforces it. Dennis Pollock: You've got to throw out huge amounts of Scripture both from Old and New Testaments to come to that conclusion, or allegorize. That would be what you are doing. Revelation 20 tells us plainly that the Lord will reign for a 1,000 years on the earth. Isaiah and other verses declare how the details of that will be involved. The fact is we will have peace. There will be no carnivorous animals. To throw all of those points out makes no sense at all. The Bible says, for example, "ask of me and I will give you the nations for your inheritance." The Father is saying to the Son, He is telling I will give you these nations. Well, if Christ is going to simply take us away and burn up the world and it is going to end, then Christ hasn't gained the nations. The Bible says we will rule on the earth. The Bible says the meek will inherit the earth and delight themselves in the abundance of peace. Scripture after scripture after scripture says there's going to come an age where there will be peace where Christ will rule. To throw that out is to do a terrible disservice to Scripture. The funny thing is, as you said the Amillennial view is currently the predominate view. You are right. But, the irony of it is, is that most of the people and their churches that technically hold to that view couldn't defend it and they couldn't explain it. They hardly know what it is talking about. It is just "their" view. The people who really study Scripture and think about it and study Bible prophecy almost invariably come to the point where they believe there will be a thousand year reign. Dr. Reagan: That's right. You know, when you said your wife said, "It doesn't make sense," well just stop and think about that for a moment. If you're going to believe in Amillennialism, then you've got to believe that we are in the Millennium now. You have to believe that the earth is flooded with peace, righteousness and justice as the waters cover the sea. Well, I certainly don't see this anywhere. We've also got to believe that Jesus is on the Throne of David when the Throne of David has always been in one place — Jerusalem. The Bible says that He is at His Father's throne sitting at the right hand of His Father's throne in Heaven. We've got to believe that Satan is bound. Is Satan bound? Gary Fisher: It depends on how many drinks you've had! Dr. Reagan: It just makes no sense. You have to spiritualize huge portions of God's Word and say it doesn't mean what it says. Gary Fisher: The wolf is lying down with the lamb today? Hardly! I was always amazed trying to figure this out as a young Bible student growing up. How can we be living in peace, righteousness, and justice; yet there are wars, rumors of wars, and so forth. The wolf is not lying down with the lamb and Satan is not bound. The Bible says he roams about like a roaring lion seeking whom he may devour. I was very confused growing up until I started believing the Bible as it is written. Dr. Reagan: Also, if Jesus if reigning today over this world, boy, He's sure doing a terrible job of it! Gary Fisher: He's not doing a very good job at all. Dr. Reagan: I tell you when He comes and reigns there is going to be peace, righteousness, and justice. Dr. Reagan: Another end time viewpoint that is being revived today which was the viewpoint of the Church in the 19th Century is called Post-Millennialism. It's the idea that the Church is going to conquer the world and convert everybody to Jesus Christ. The Church will reign for a thousand years and at the end of that time Jesus Christ will come. Post-Millennial means "after the Millennium." Again, this is a view that died at the beginning of the 20th Century, but it is being revived today. Many different Christian leaders today are reviving this idea that the Church is going to have an international peace plan and will go out and conquer the world for Jesus Christ. The Church will be able to convert all of these people and we will reign over the whole earth. What about that? Gary Fisher: One of the major features of this view is it lends itself to the inevitable progress of man. Anybody who is able to look at the news today with the reports of hurricanes, earthquakes, the condition of man, lawlessness and all that horrible stuff and say that the world is getting better is really on another planet. Dr. Reagan: Well, that is what killed this view off in the first place. In the beginning of the 20th Century we had World War I, the Great Depression and World War II. People began to realize, "Hey, things are not getting better." It's based upon the assumption of the progressive mankind, that we're getting better and better and better and the world's getting better and better. When you read articles by these guys you wonder if they are living on a deserted island someplace where there is no news media. Dennis Pollock: Post-Millennialism not only goes against what we see as far as current conditions, but it definitely goes against Scripture. The two primary places where you find a description of the events that will be going on just before Christ returns are going to be the book of Revelation and the prophetic sayings of Jesus in the Olivet Discourse. In both cases, they are describing a wicked world that God is not at all happy with. Think about it, Revelation shows an angry God, and so if this Post-Millennial view is right, the world is getting better and better and by the time Christ comes we are all in a state of perfection. Everything would be going just hunky-dory, and yet the Bible says in Revelation that God is angry and so the wrath of the Lamb has come and judgment is being poured out. Bowls of God's anger are being poured out. It is not a happy place! So, the Post-Millennial view totally contradicts what Jesus teaches. 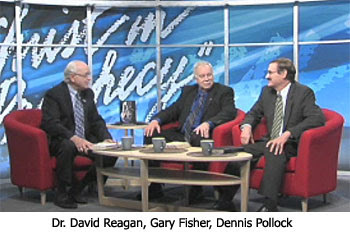 Dr. Reagan: Plus, Jesus makes it clear in His teachings that the world is never going to be converted to Jesus Christ. He says that the road to Hell is very wide, and narrow is the road to Heaven. He talks about in the Parable of the Sower how only one out of four are being saved. Post-Millennialism just goes against Scripture. Dennis Pollock: And, He says, "As it was in the Days of Noah, so it will be in the Days of the Son of Man." In the days of Noah things weren't going that well do to wide-spread immorality and violence. Gary Fisher: I would like to tandem off of Dennis' point. The Scripture demands the absolute opposite of the inevitable progress of man. The Scripture says in the last days mankind will go from worse, to worse, to worse, to worse in a terrible downward spiral. The other thing I would like to comment on concerning this viewpoint, and this makes it very suspect, is that they take it that the Church has replaced Israel. Certainly the Church has not replaced Israel. In the last part of this series covering prophecy questions, our panel will explain why they believe the Pre-Millennial views of Christ's reign on earth to be the most logical. I hope this isn't too much off the subject but when or where do the two witnesses come in, I always thought they came in as the church saints went up? Any views appreciated. "...This has been picked up again and continued here..."
And you'll still remain anonymous, after all, the "person" that created this blog has been doing it for yrs -["Nathan", we discovered recently, is actually an "AI", kinda like Max Headroom, the pix of him are photoshopped, and the man of mystery still remains at large...]! Go "here" for a helpful hint on "how to". This will also save you a little time too for any of your future posts. Anonymous, check out Dr. Reagan's article for more info on The Two Witnesses. Guys,you got to check out this blog about the strange religion of Islam,did you know the Koran actuall says JEWS were CHANGED into MONKEYS?